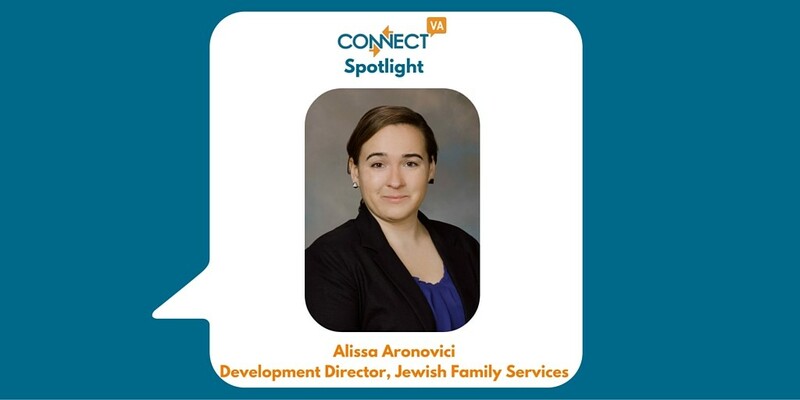 Get to know Alissa Aronovici – Development Director for Jewish Family Services, YNPN RVA Leadership Team Member and this week’s ConnectVA Spotlight! My name is Alissa Aronovici and I am the Director of Development at Jewish Family Services (JFS). I started at JFS last December. 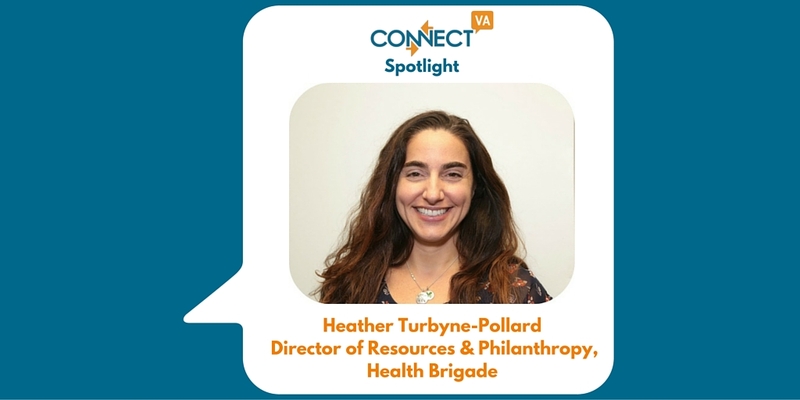 I have worked in the Richmond nonprofit sector for the last few years but I’m so thrilled to be part of an organization that delivers direct health and human services to those in our community that need it most. I have an undergraduate degree in International Relations from the College of William and Mary, a graduate degree in Middle Eastern Studies, and a certificate in Fund Development from the University of Richmond. I also serve on a few local nonprofit boards and enjoy volunteering in the community. Jewish Family Services is a full service health and human service agency that serves the local Richmond community. The programs at JFS support and strengthen individuals and families of all ages, races, beliefs, backgrounds, genders and circumstances. We offer counseling, home care, adoption, volunteer services, caregiver respite, and care management and have been serving the local community for 167 years. 55% of our clients live below federal poverty levels and we are one of the few agencies that accept Medicare and Medicaid clients. Many wouldn’t have other options to access the services they need if JFS weren’t here to support them. We have a very robust program that focuses on senior health care issues and provides comprehensive services enabling poor, chronically ill seniors to live safely and independently in their own homes while increasing access to critical healthcare services. The most rewarding part of my job is that I help raise funds that directly support our clients and meet the critical needs that exist in our community. Whether it’s a senior fighting isolation or a child experiencing social problems at school, the JFS staff is here to help and I am so grateful to be a part of this organization. I love getting up in the morning knowing that what I’m doing is going to help improve the quality of someone’s life. I also really enjoy working with our donors and helping them connect their philanthropy to a cause or specific JFS program that they are passionate about. It’s incredible to see the impact our donors have on the lives of our clients and I really enjoy helping them realize the difference they can make. One of our challenges is that a lot of people think that JFS is a religious organization or that we only provide services to Jewish clients. It is true that our mission and guiding principles are based on Jewish values, such as Tikun Olam – repairing the world through dedicated service, one client at a time. However, we are not religiously affiliated and we take pride in the fact that our clients come from such diverse backgrounds. We are also constantly striving to find new sources of funding. We have such passionate and dedicated donors but with the increasing costs of healthcare, we are always searching for new and innovative fundraising opportunities. The more money we can raise, the more clients we can serve. We have just started a new program, in partnership with the Weinstein JCC, called EnRich for Life. It is a holistic program designed to provide for the social, physical, and mental health of seniors (age 65+) that will foster socialization and keep them connected to the community. EnRich for Life meets once a month and encompasses three key pieces: a speaker’s series which includes lunch, a creative class and a fitness class. The next sessions are on Monday, November 23rd and December 14th. We are also gearing up for our big fundraising gala, The Big Schtick. This year’s event will take place on Saturday, February 27th and will feature dining, silent and live auctions, and a breakfast bar culminating in a live raffle drawing for prizes valued at $10,000+! We are currently looking for corporate sponsors and individual tickets will go on sale in January. We love partnering with ConnectVA and I am so grateful to have such a wonderful resource in our community. It creates a platform to share relevant information and exchange ideas with other nonprofit professionals. JFS has lots of volunteer opportunities that we post on HandsOn and I always enjoy finding out about interesting upcoming events. ConnectVA is also the first place we post job opportunities and we’ve had great success in finding highly qualified candidates through the Job Finder. JFS has lots of great volunteer opportunities and a variety of ways to get involved and make a difference in a client’s life. You can go to our website – www.jfsrichmond.org – to find out about specific opportunities and learn more about our programs. You can also sign up for our newsletter to stay up to date on JFS news and upcoming events!